DC, we’ve got pretty slim pickings when it comes to good vegetarian Mexican food, even when we’re willing to pay upscale prices. 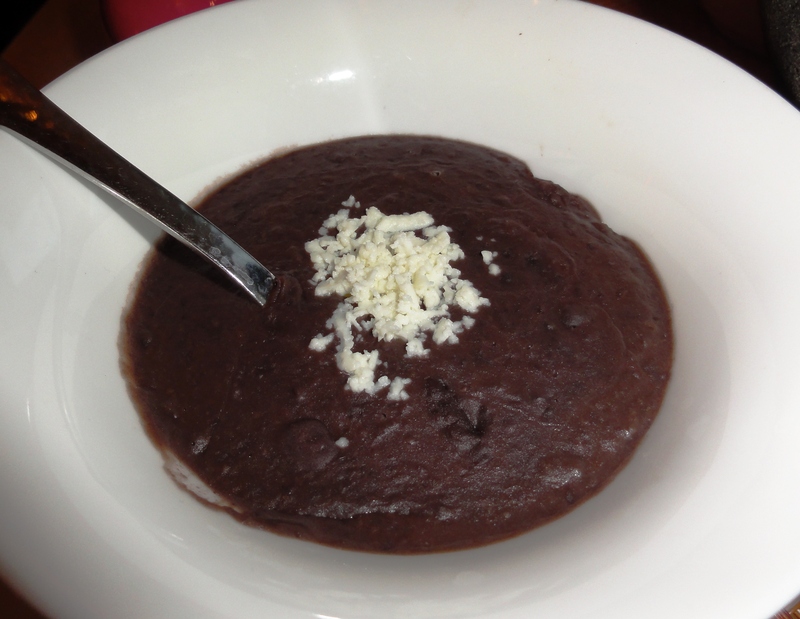 Oyamel and El Centro DF both offer more creative cuisine, but our hankerings for classics like saucy enchiladas and meat-free refried beans ‘n’ rice send us to the oft-maligned Rosa Mexicano in Chinatown. 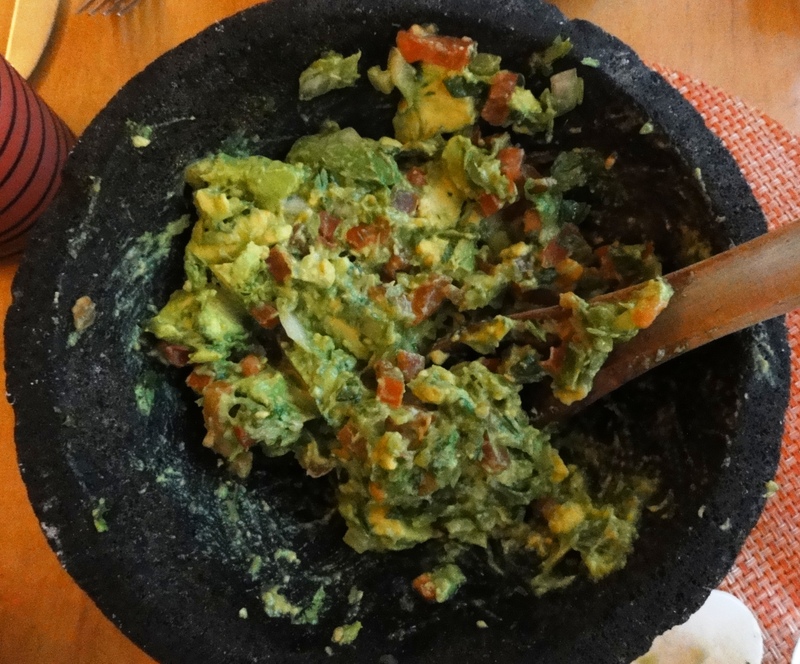 The famous $14 prepared-in-front-of-you guacamole is pretty much perfect. It’s worth indulging in, especially with a dash of accompanying tomatillo salsa. It’s served with soft tortillas and chips, which can be fried in a vegetarian-only fryer if you prefer (best to call in advance so they can prepare but they will accommodate walk-in requests as well). Besides being delicious, guacamole wrapped in tortillas adds a little heft to the otherwise spare vegetarian menu: the three choices are roasted vegetable tacos, cheese enchiladas, and an off-the-menu quesadilla with huitlacoche fungus and mushrooms. On a recent visit we got our usual enchiladas and had a first taste of the quesadillas. 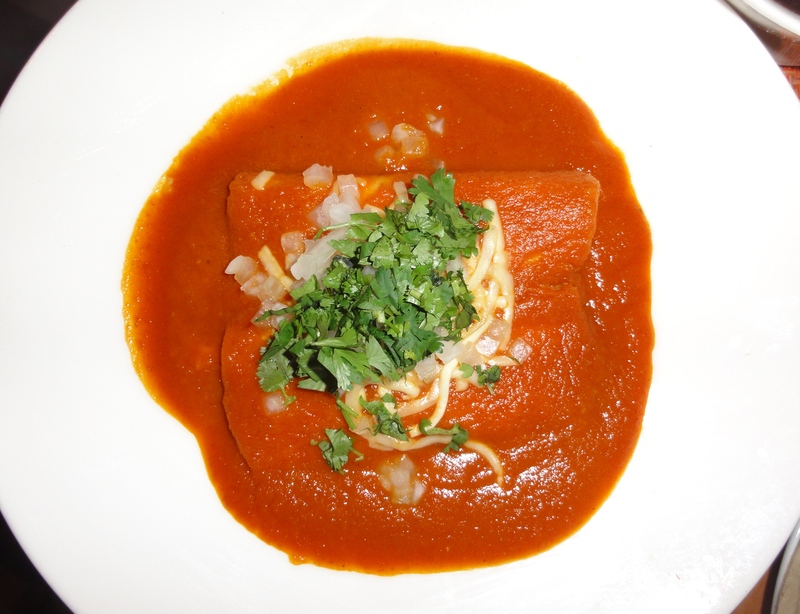 Rosa’s enchiladas, filled with melted Chihuahua cheese and smothered in flavorful roasted tomato sauce, are as satisfying as you’d expect. And, accompanied by tasty brown cilantro rice and blended black beans (both vegetarian, which is actually pretty hard to find), the enchiladas offer the most bang for your buck. The vegetable quesadilla, stuffed with Burns Farm huitlacoche, wild mushrooms, and Chihuahua cheese, is definitely worth sampling as well. Apparently it debuted at the original New York location, and as long as the kitchen has the ingredients on hand, the chef is happy to whip up an order. 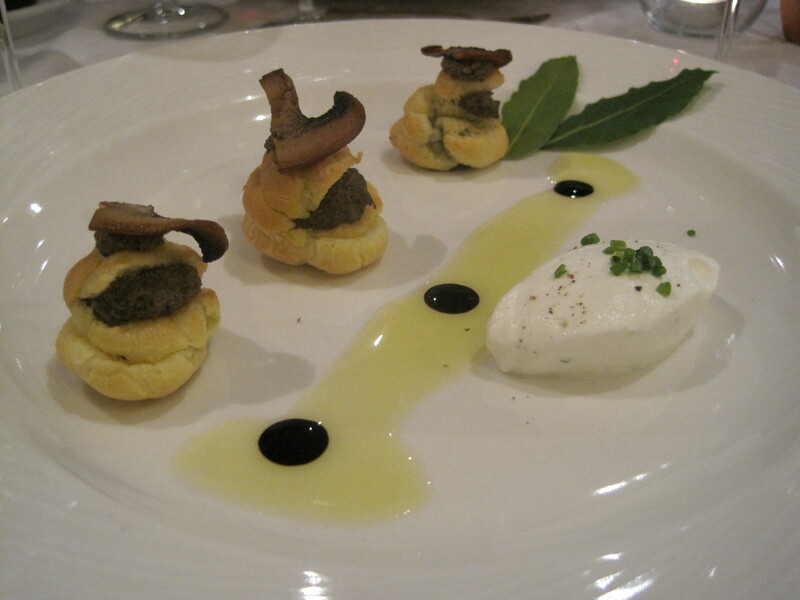 Ours were spiked with fresh mint, which provided a nice counterpoint to the creamy cheese and mushrooms. 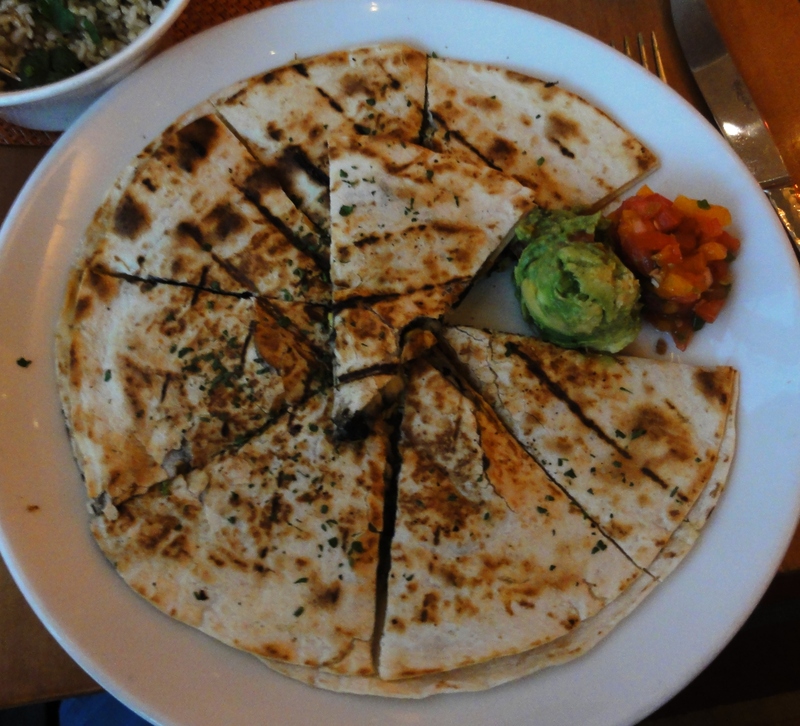 Rosa Mexicano won’t blow your mind with originality, but it consistently ticks all the boxes of high quality, vegetarian-friendly standard fare: margaritas, guacamole, chips, rice, beans, and oozy cheese. And for those who can manage dessert (margaritas and chips always push sweets off the table on our visits), the theme of decadent comfort food continues with churros, flan, tres leches, and homemade ice cream. 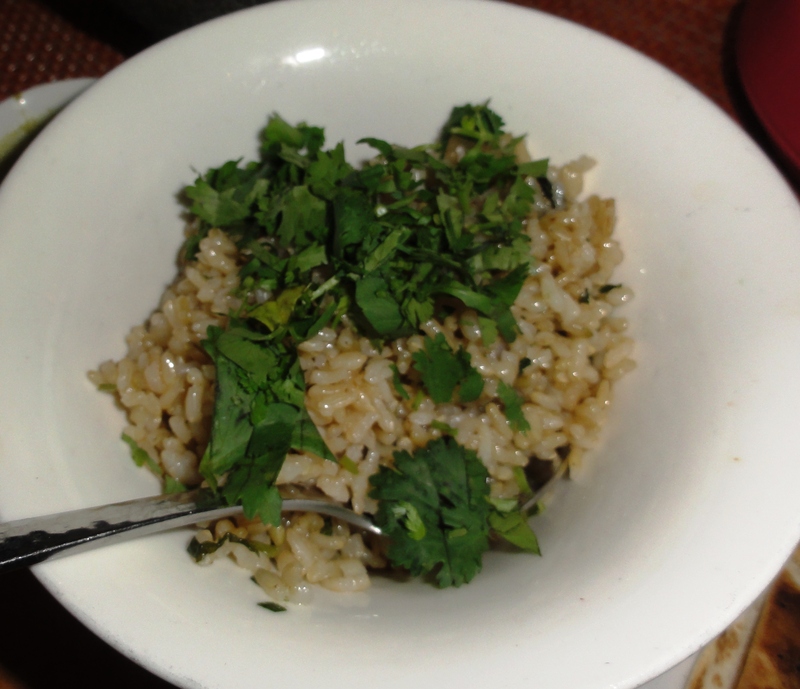 Del Campo: Where there’s smoke, there’s….vegetarian food? Walk into Del Campo in Chinatown and you’ll immediately get a faint whiff of smoke. Take it as a sign of things to come – pretty much everything you’ll eat has been grilled, smoked, or charred. This includes an array of vegetables and vegetarian items, with some obvious choices like asparagus and tomatoes but other surprises including beets and peas. The vegetarian asado menu (!) is a splurge at $72 but looks worth it, with tastes of several charred vegetables, peppers, potatoes, smoked ñoquis (gnocchi), ratatouille, and grilled cheeses and ice creams. You need to make a separate reservation to sit at the asado table so plan ahead if you want to go all in. 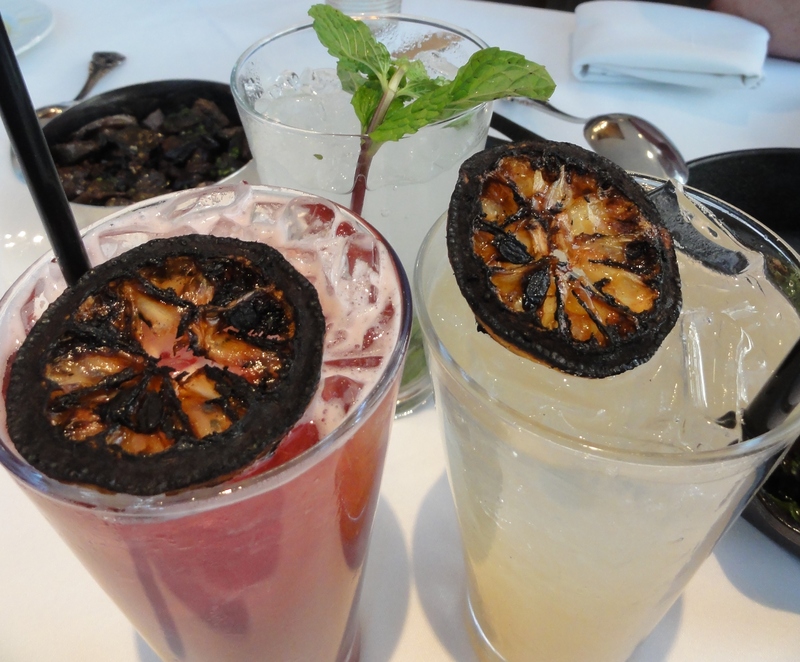 We chose from the standard menu on our visit, starting with Limonada and Chicha Fresca to drink. The flavors from grilled lemons and smoked applewood syrup didn’t really come through in the lemonade, but the Chicha Fresca was sweet, spiced and refreshing. We started with smoked mushrooms and charred beets. While the mushrooms were very well done, the combination of smoky flavor and meaty texture was a bit overwhelming for me – almost TOO meaty. Charring beets turns out to be a great idea, transforming both the texture and taste to something completely different from the usual boiled or roasted version. They were crisp and tender and just slightly sweet, complemented by a bit of balsamic reduction, boucheron, and grilled onions. 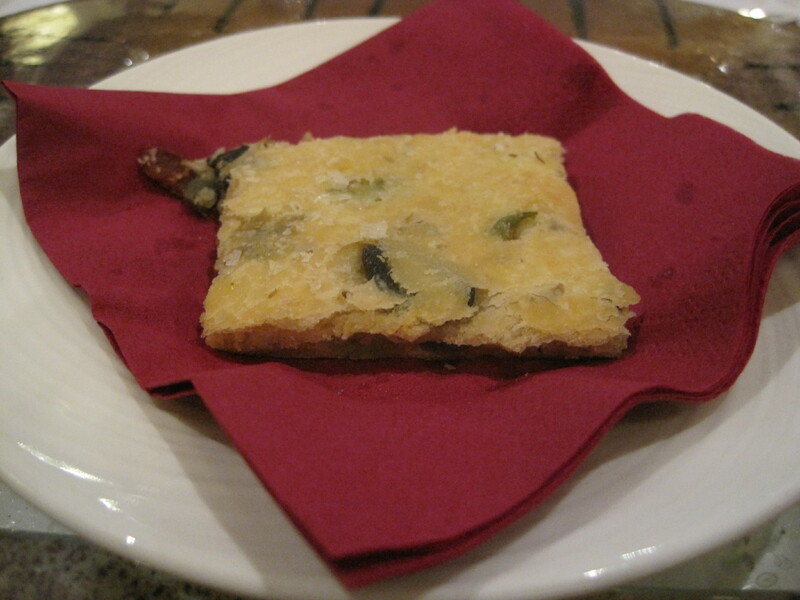 Del Campo’s vegetarian entree is a pasqualina tart, the Italian answer to the pot pie. 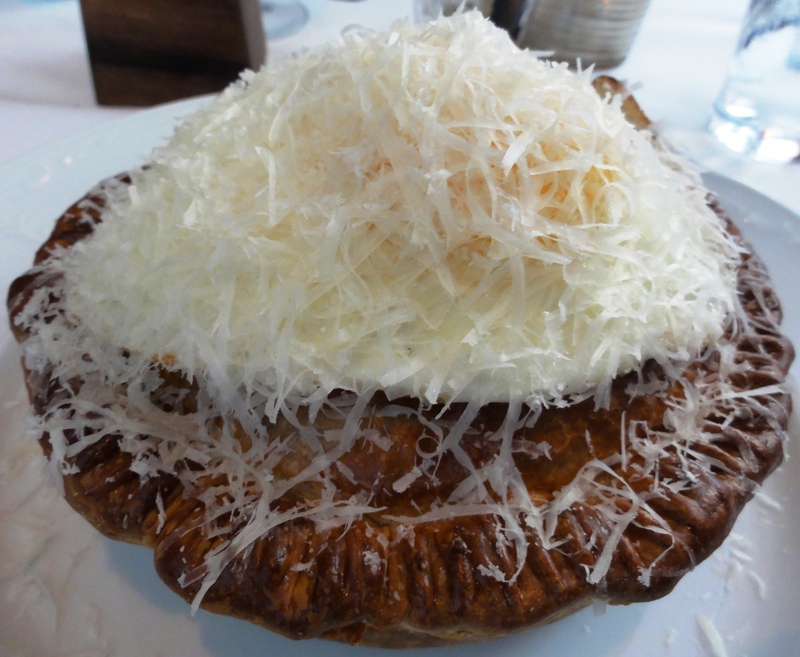 It’s huge and beautiful, topped with a fried egg and heavily dusted with parmesan. I was particularly impressed that it looked like nothing else on the menu. The chef could have easily phoned it in with a generic vegetarian entree, particularly at a restaurant so clearly geared toward meat. Instead he created something thoughtful, satisfying, and (according to my omnivorous companions), even better than their meat and fish entrees! 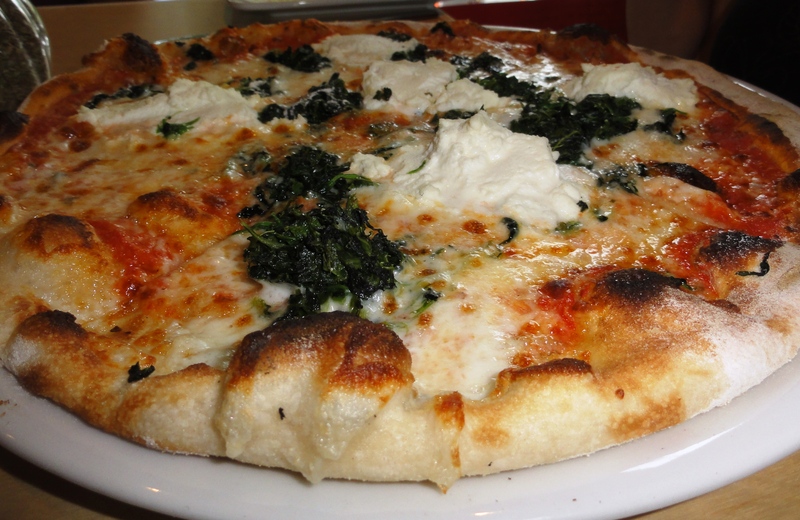 The crust is hearty and crunchy rather than buttery, giving way to a tasty filling of bechamel, swiss chard, and more cheese. 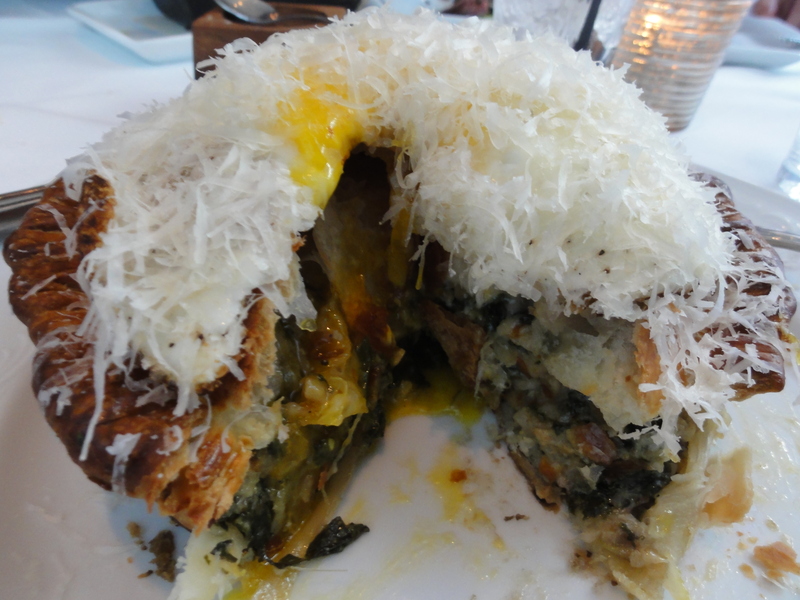 For those of you who run from runny yolks, order it without the egg – it’d be just as good. I took a substantial chunk of the tart home without knowing how well it would hold up, but it reheated perfectly without getting soggy. 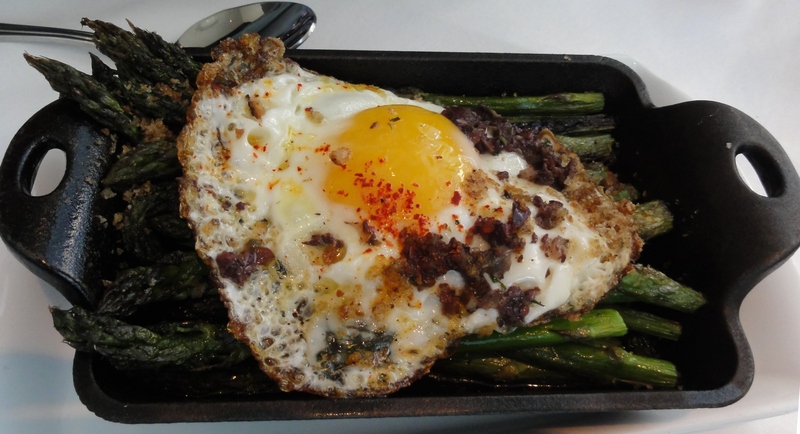 Grilled asparagus with egg and tapenade (the secondary theme here seems to be ‘If you like then you should put fried egg on it’) was well-seasoned, but next time I’ll be tempted to try something else off of the sides menu – maybe charred cauliflower, grilled polenta, or yucca with salsa criollo. 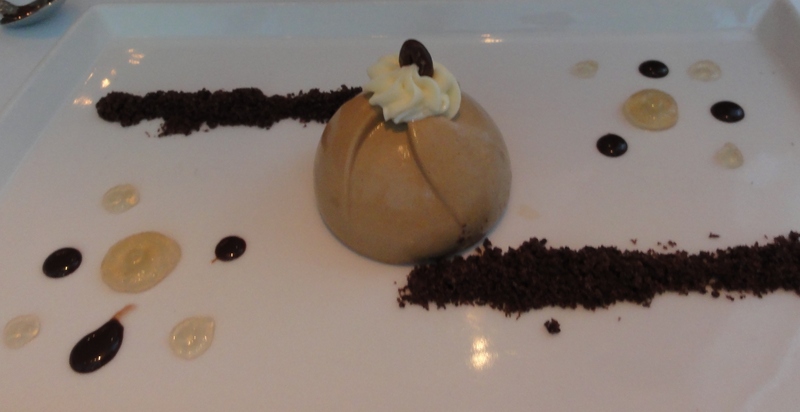 For dessert we had the El Capuchino, composed of a light hazelnut cake topped by coffee mousse. Espresso-flavored crunchies tasted pleasingly burnt, but you might be better off choosing something more along the asado theme like grilled lemon pound cake with grilled strawberries or El Chocolate with roasted banana ice cream. 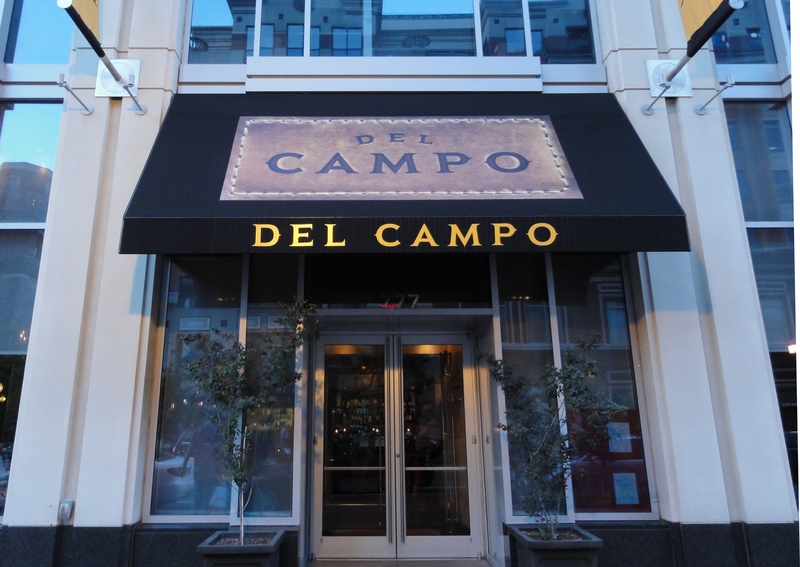 If you’re a fan of smoky flavors or veggies from the grill, Del Campo is definitely worth a visit. Dine from the regular menu to get a sense of flavors and options before committing to the prix fixe tasting menu. 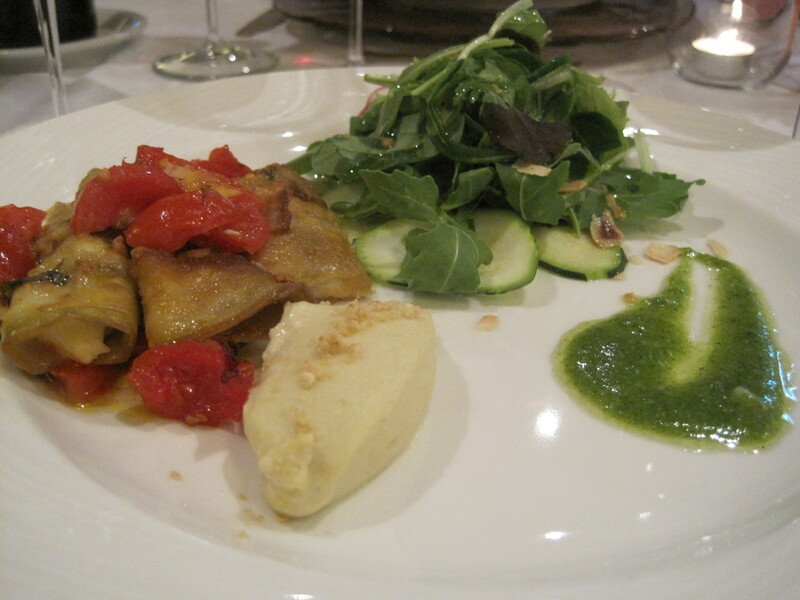 And even if you don’t get to it, aren’t you happy to know that such a thing as an asado vegetarian tasting menu exists? 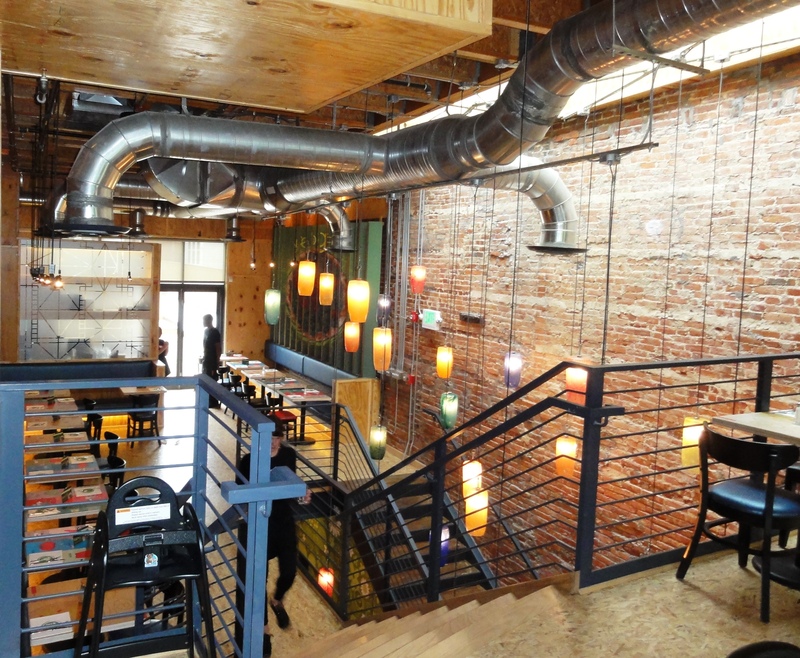 Piola pizzeria, with locations literally around the world, opened a new branch recently on 14th Street near Florida in the U Street neighborhood. It looks small from the outside, but opens up to a large ground and second floors along with a back patio. The menu is extensive and takes some time to get through. 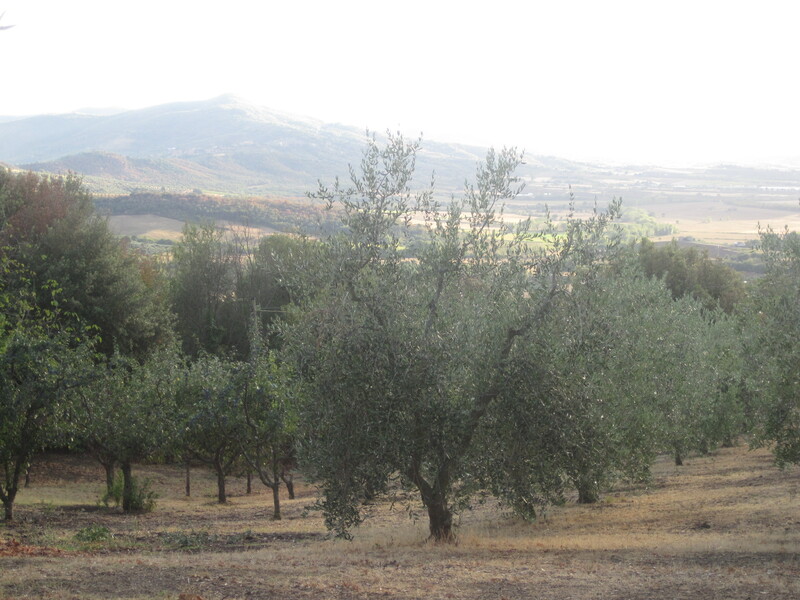 We decided to stick to pizzas and ordered 5 for the group, forgoing pastas (pretty standard – pesto, marinara), antipasti and some hearty-sounding salads. Happy hour runs from 5-8 and drink prices including $4 wines and beer apply to people seated for dinner, which was a nice surprise. 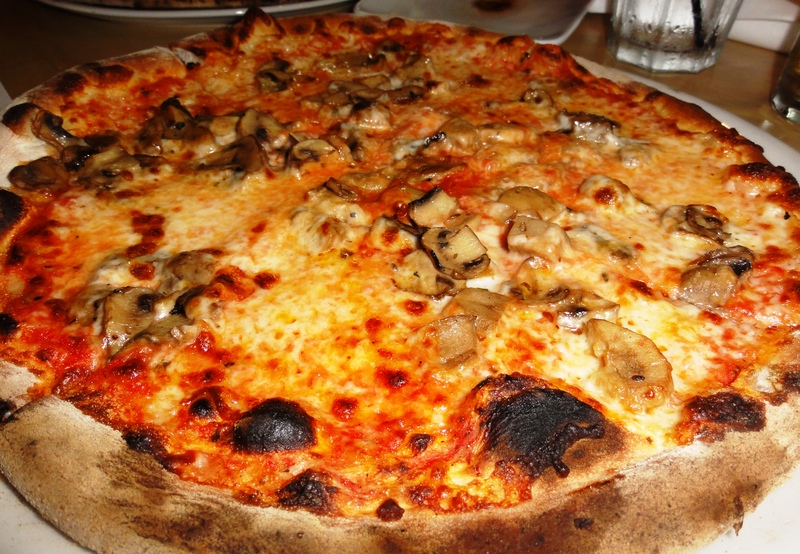 In general we found the pizza to be soggy on arrival, even when freshly baked. This was a little disappointing, but there were some high points flavor-wise. 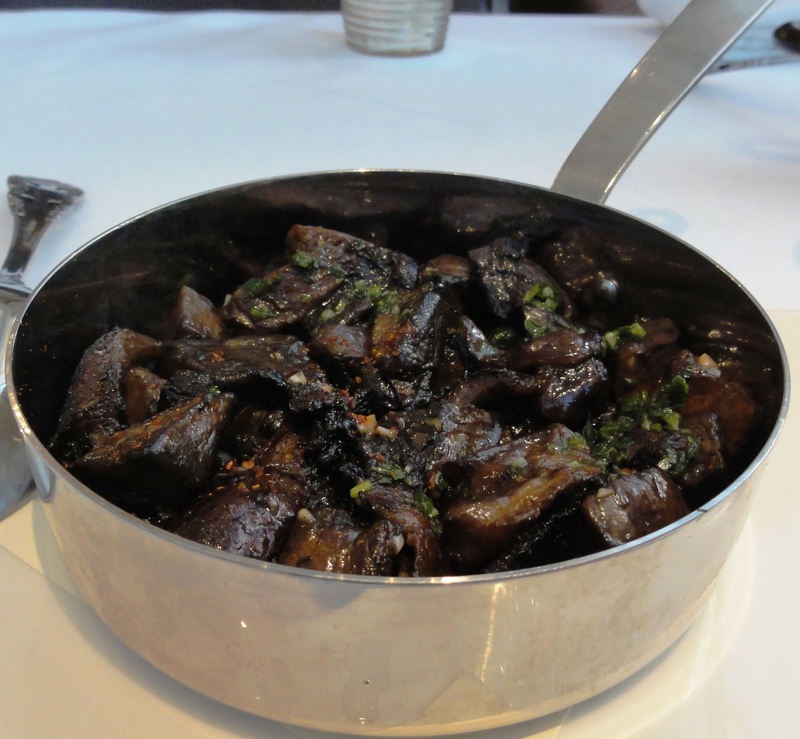 Funghi misti (sauteed mixed mushrooms) and parma with roasted eggplant were our favorites, with a good balance of toppings, sauce and cheese. 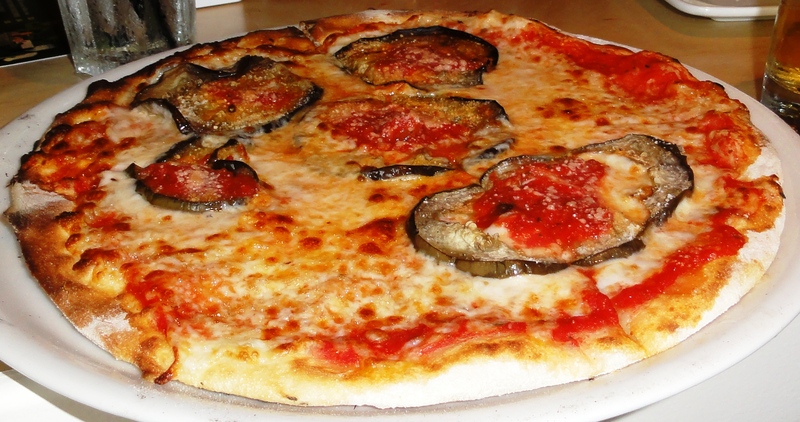 The parma was extra saucy and zippy, reminding us eggplant parmesan. We also tried the quattro formaggi, braccio di ferro with ricotta and spinach, and Miami Beach with fresh mozzarella, arugula and tomatoes. 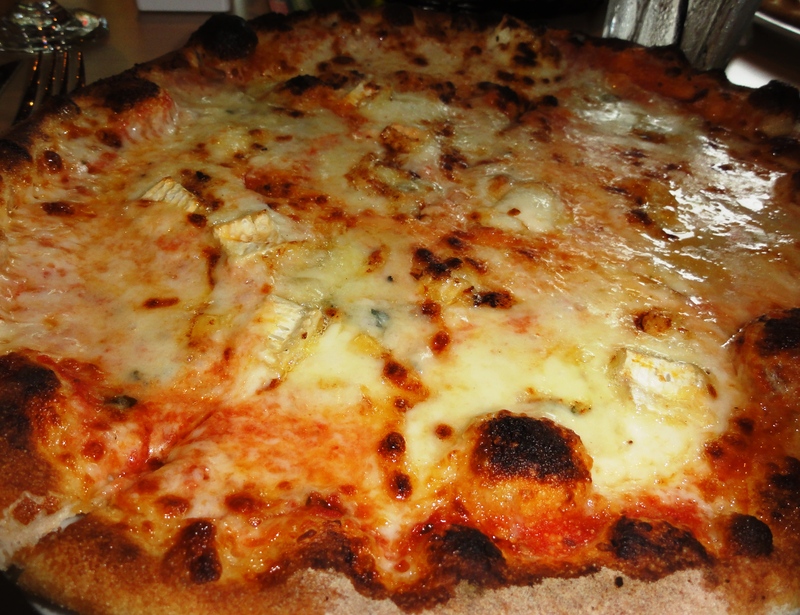 Everyone agreed that the four cheese pizza was overly salty and rich, maybe as a result of too much brie. We like Paradiso’s version better, where fresh mozzarella tempers the saltier cheeses and gorgonzola and garlic spice things up. 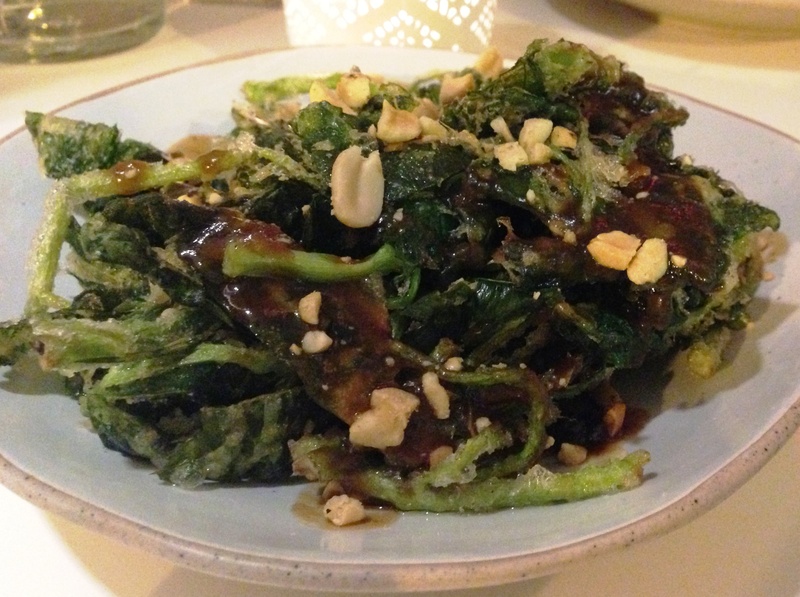 Braccio di ferro was nice, with pillowy mounds of ricotta and sauteed spinach. All it needed was a dash of salt and we were good to go. The arugula and tomato pizza was, predictably, a cheese pizza with a salad on it. It’s a tasty salad because you can’t really mess up arugula, but we’d rather go for a real salad and let the pizza be a pizza. One thing to note is that the ‘individually sized’ pizzas are a bit too big for one person but not enough for two people to share, so get ready for some creative group ordering (maybe throw in pasta or a salad) or leftover boxes. Boxes in hand, we turned to dessert. We were intrigued by two that promised ‘cookie cups’, which just turn out to be large wafers without much flavor. 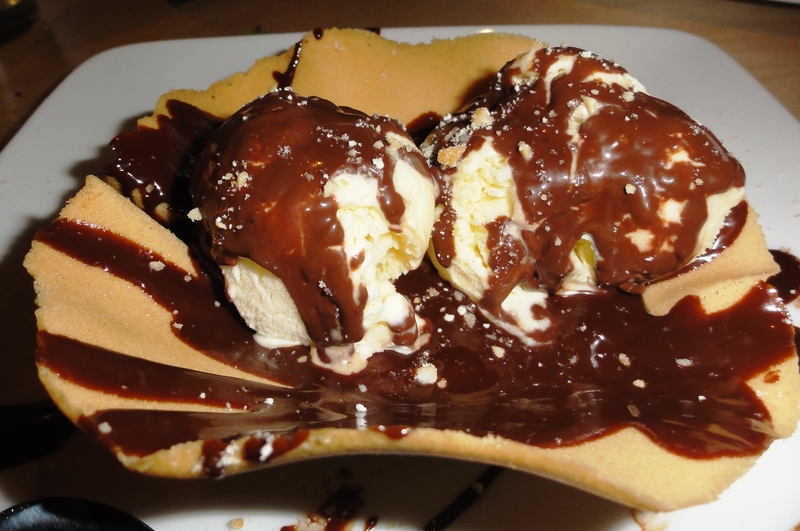 The chocolate sauce, on the other hand, was rich and tasty, as was the chocolate cake in the torta nera (not shown). With its solid if not exactly crispy pizzas, generous happy hours and portions, and large patio, Piola is a welcome addition to the neighborhood. Ambar, Capitol Hill’s newish Balkan restaurant, piqued our interest a couple of months ago when we saw a good number of meat-free items on the menu (from what we could tell, at least. It turns out that multiple shades of grey don’t always make for an easy read). Thankfully paper menus provided better contrast for our rheumy over-30 eyes, and we settled in at a casual table upstairs to make some choices. 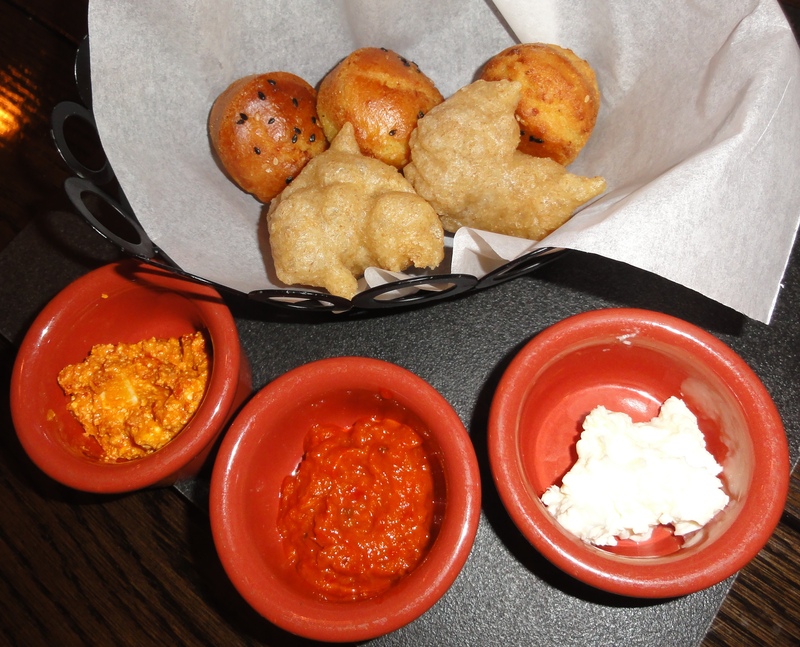 We started with a mix of cornbread and fried sourdough in the bread basket, accompanied by three spreads: sweet red pepper, buttery cheese, and a spicy mixture of red pepper with cheese. The combination was by far our favorite, zippy and creamy with chunks of what tasted like a cross between cottage cheese and ricotta. Both breads were nice although the sourdough was on the greasy side. Amongst the four of us we ended up ordering most of the vegetarian plates under the soup/salad, pastries and vegetables sections of the menu. A few additional items like grilled asparagus could be made vegetarian by omitting bacon etc, but we didn’t order them. 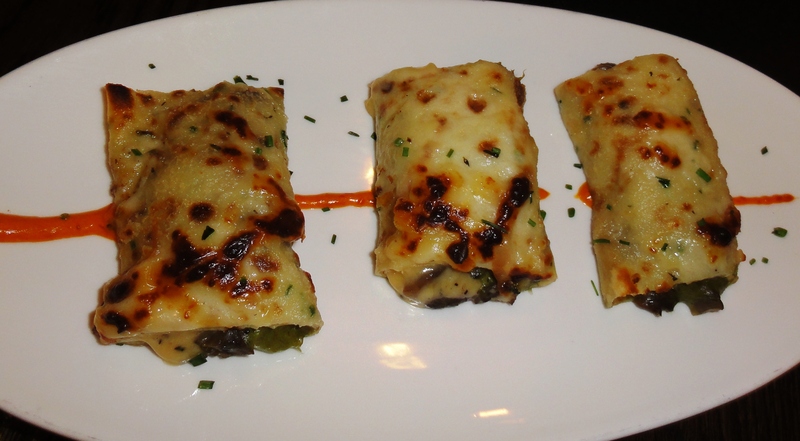 Oozy crepes stuffed with gouda, bechamel and sauteed mushrooms were flavorful and satisfying. Cheese pies were fluffy – a welcome change from the denser, saltier Greek version – and surprisingly well-complemented by fresh cucumber yogurt. Red peppers stuffed with that fresh cottage/ricotta-like cheese and drizzled with cranberry sauce were exceptional, especially with bites of roasted eggplant puree. Not all dishes were a hit. 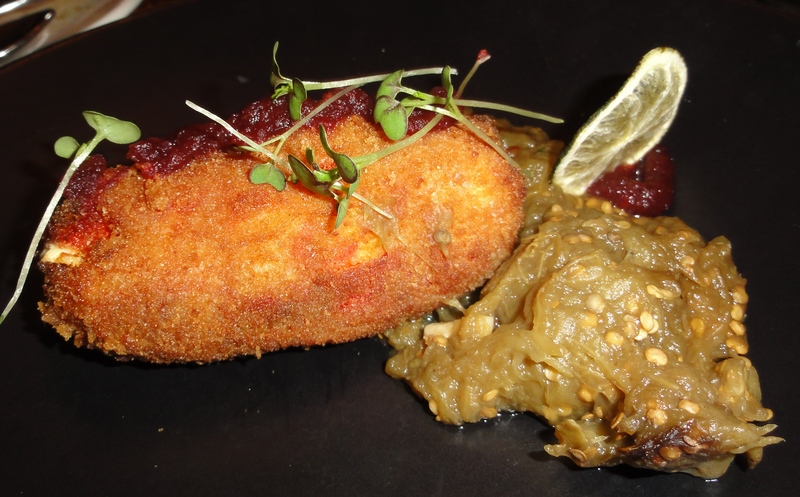 We found the leek croquettes a bit heavy and bland without a bright garnish or side to pick them up. 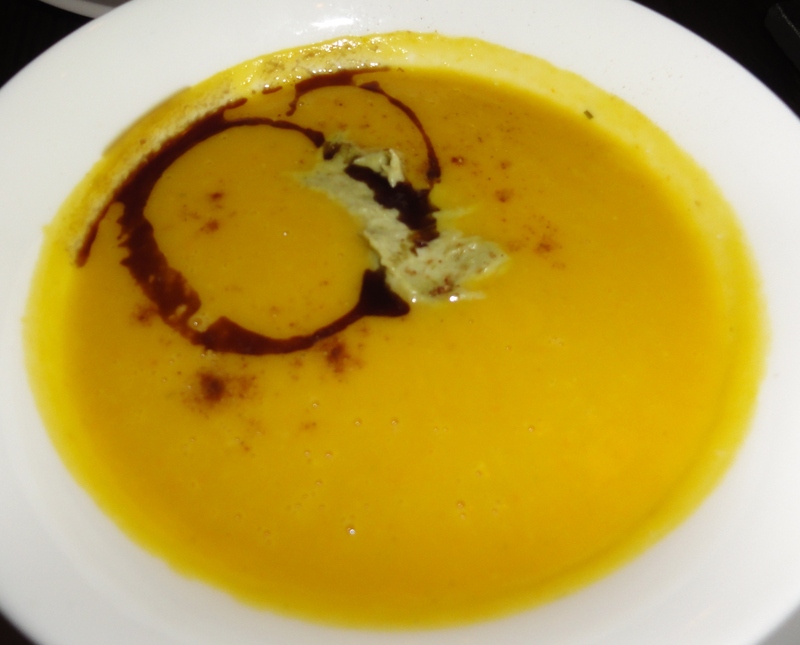 Butternut squash potage was also unremarkable, although the dollop of leek puree on top was a nice touch. 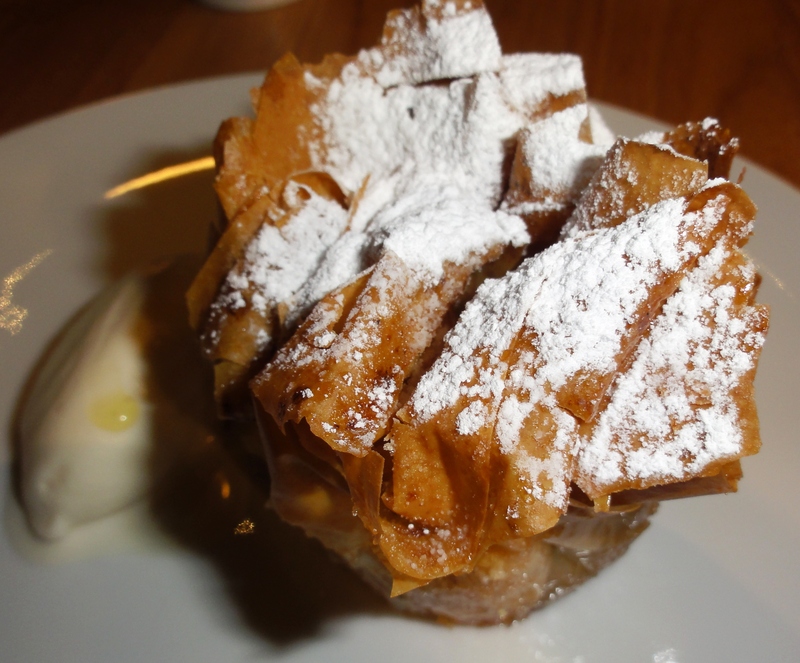 Desserts like ‘the four chocolates’ and ‘forest gnocchi’ sounded intriguing but complicated, and we passed them over for what seemed like a simpler choice, Balkan apple pie. The presentation was gorgeous and many of the components were tasty – phyllo cigars filled with fruit, towers of caramel mousse, and blobs of apple gelee. However, they didn’t meld and the overall effect was more fussy than rich, melty and comforting. It might have just been our mood though, because the pop tarts, chocolate pie and giant shakes we downed at Ted’s Bulletin for second dessert (!) hit all the spots. 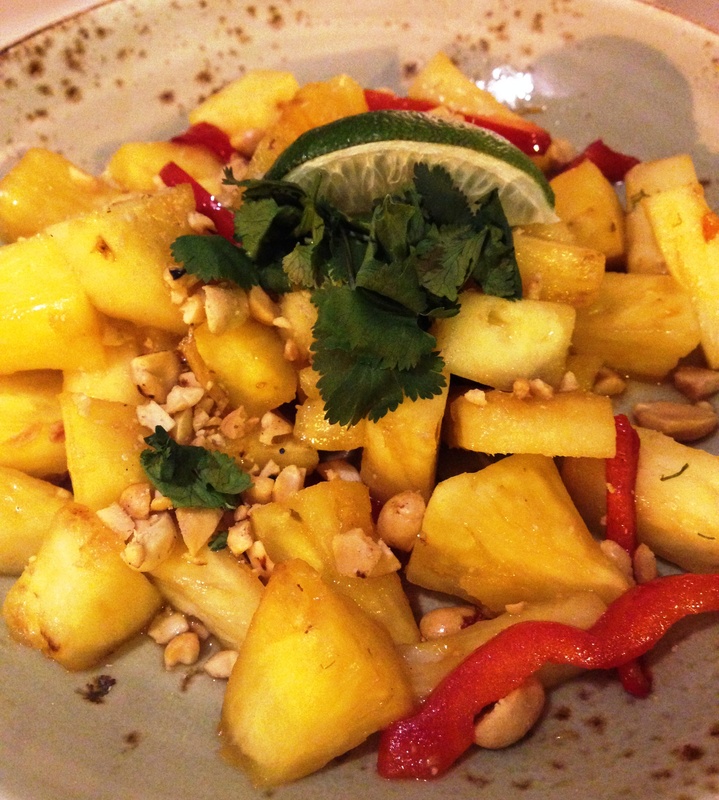 Ambar is a lovely addition to Barracks Row and the DC dining scene. Service is welcoming even during busy times and although the menu is meat-centered, most vegetarian items are unique and thoughtfully executed. 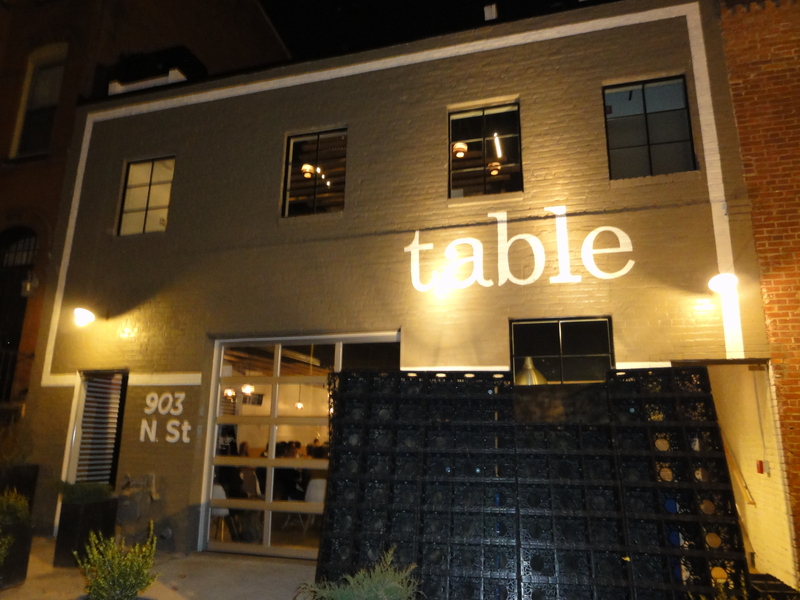 There’s been a lot of buzz around the newly opened Table in the Mount Vernon area. 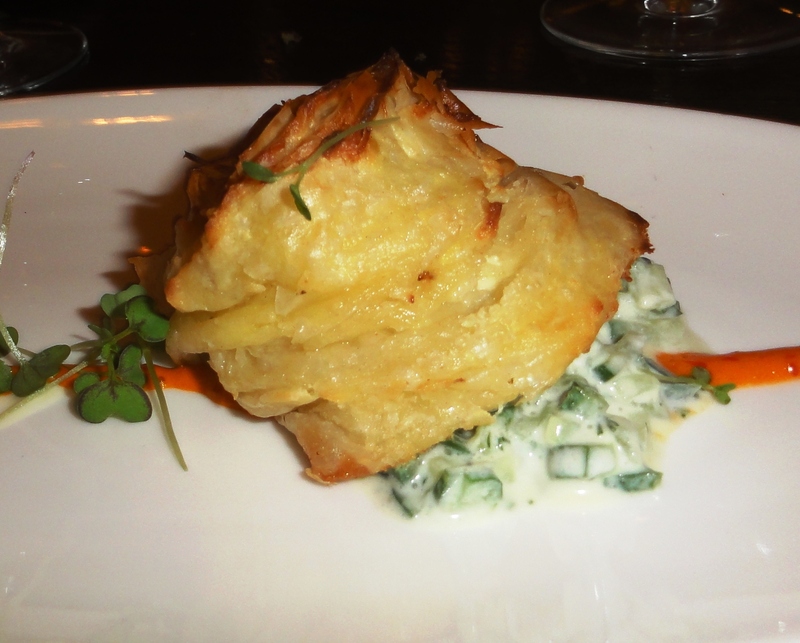 We checked it out the other week to see how the vegetarian fare….fares. 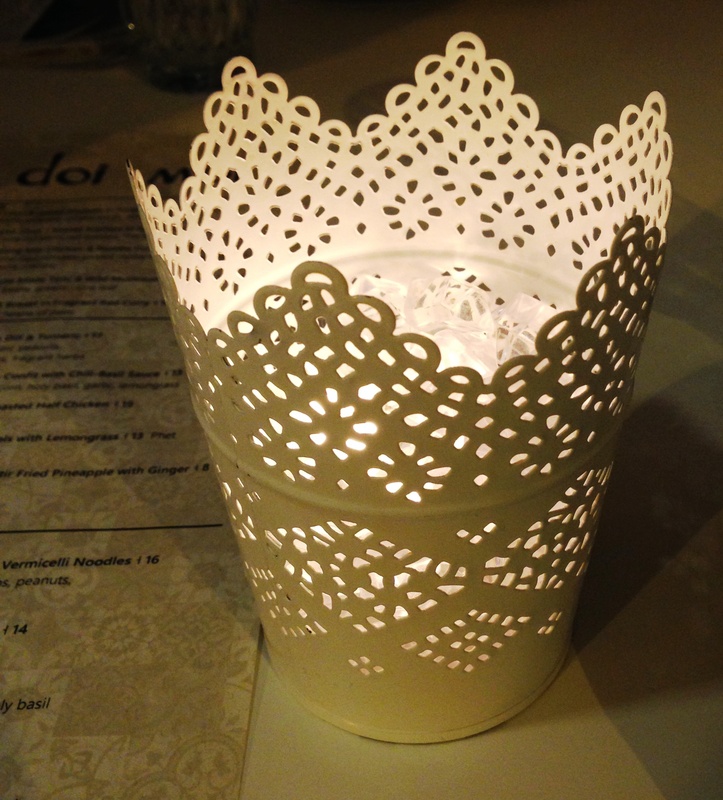 Table’s decor is stylish yet cozy and comfortable, with friendly service and an enthusiastic staff. Hand-written menus are sweet but kind of hard to read (wow, I sound old). We sat at one of the chef’s tables which overlook the prep area, so we had a view of the appetizers being prepared and plated. 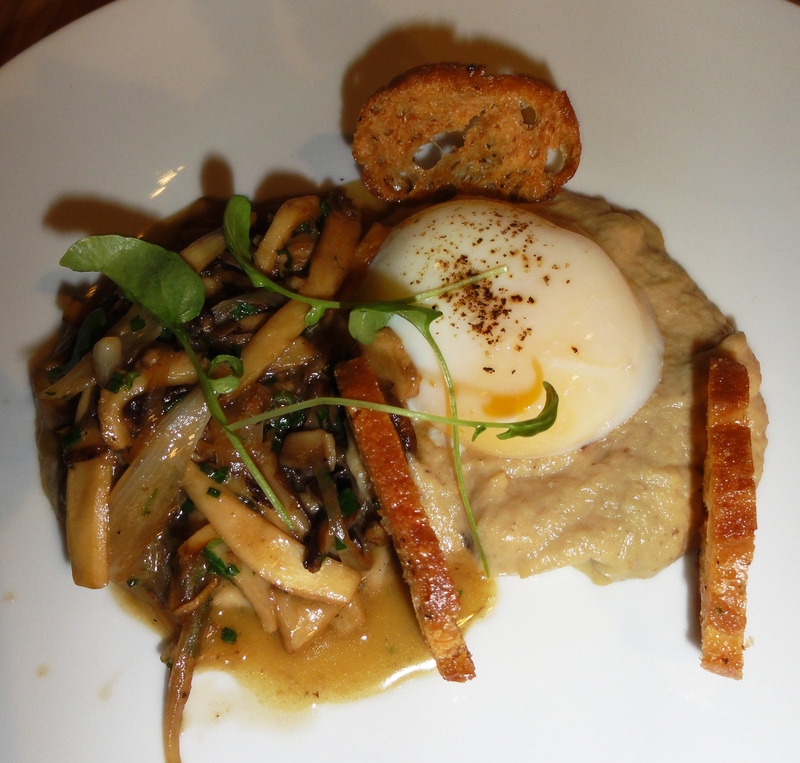 I passed over vegetarian cauliflower soup with capers and started with mushroom toast with poached egg and trumpet puree. It was earthy and rich, almost as filling as a main course. I’m not normally a fan of poached eggs but here, it mixed with the puree and mushroom juices to form a satisfying sauce. Yum. 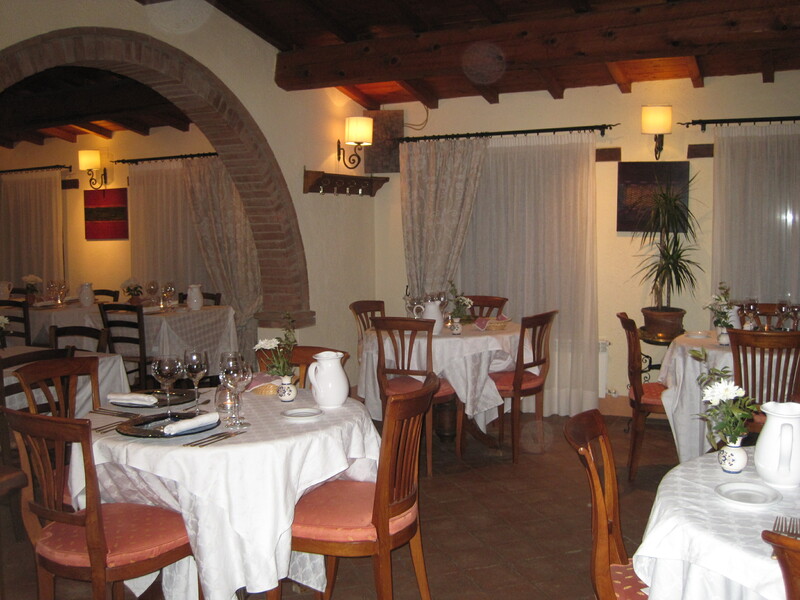 Currently there’s only one vegetarian main course, which is to be expected in a small restaurant with a small menu. 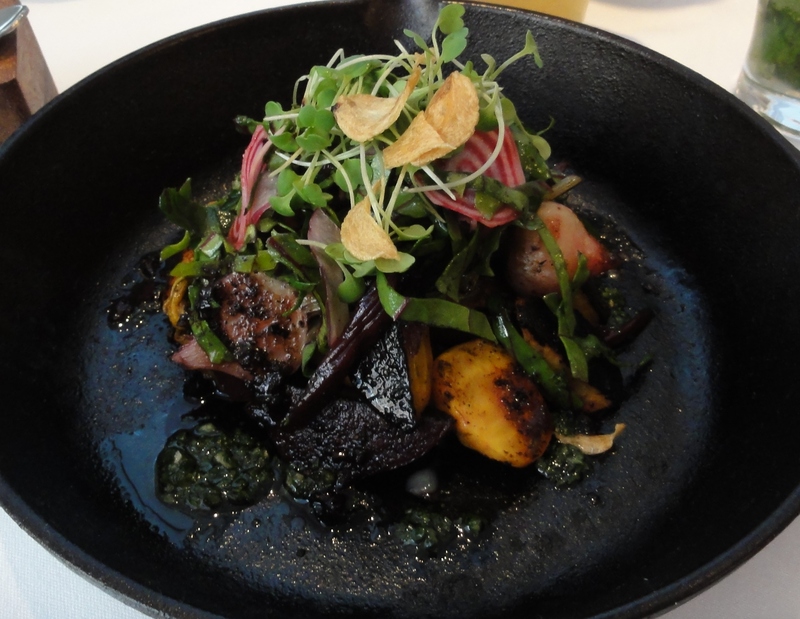 I wasn’t sure how excited I could get about a dish called root vegetables, but they were a pleasant surprise, flavorful and beautifully executed. On the plate were more woodsy mushrooms, gorgeous purple potatoes, fennel bulbs, sweet onions, carrots, and a wedge of roasted winter squash, all accompanied by a bright dollop of parsley lemon pesto. Every component was cooked and seasoned perfectly. 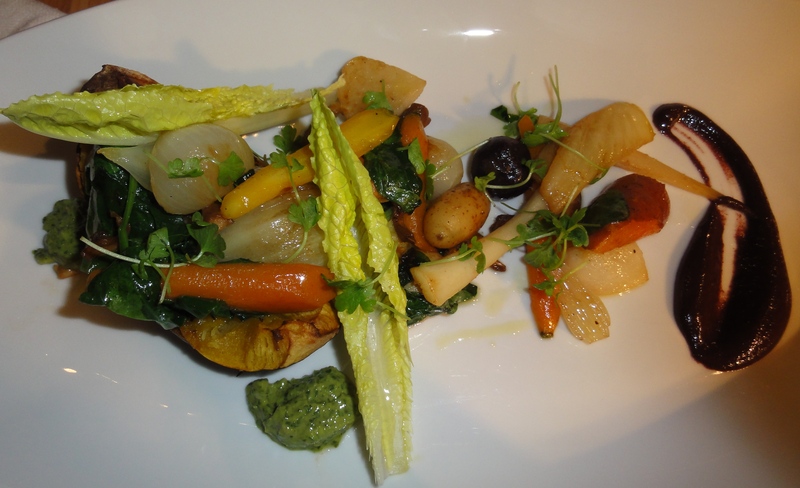 If Chef de Pue can make a plate of vegetables taste this good, I’d love to see what he can do with a vegetarian pasta or savory pastry. 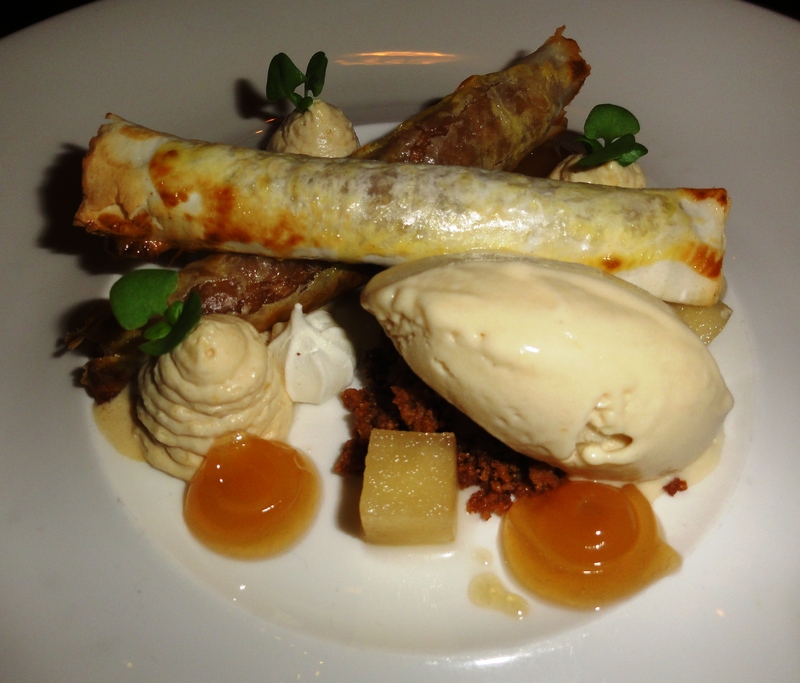 For dessert we tried apple crostata with honey truffle gelato. 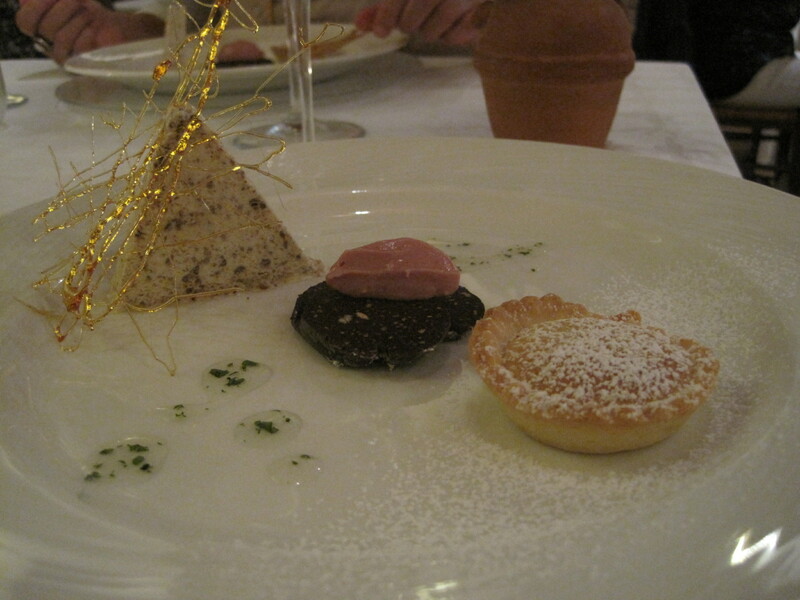 The crostata was great – super crispy and flaky with tart fruit. The gelato, on the other hand, was a bit low on honey flavor and the drop or two of truffle oil felt like an afterthought. Next time we’ll go for hot chocolate mousse. Table serves simple, expertly crafted dishes in a relaxed atmosphere. 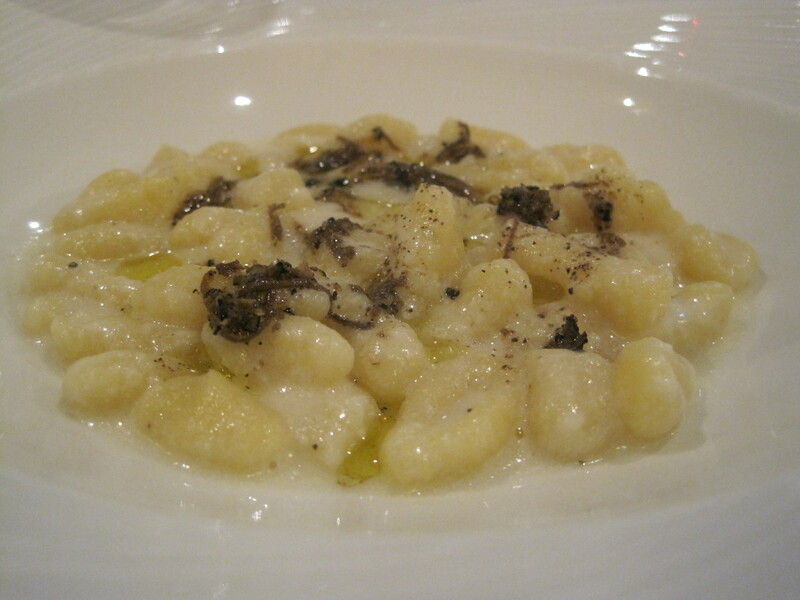 Because of its limited menu, Table is better for a small dinner or date rather than a group of vegetarians. I’d also suggest that you check the seasonally-driven menu to make sure you like the current offerings – for example, I’ll wait for a new spring-inspired main course before I return. 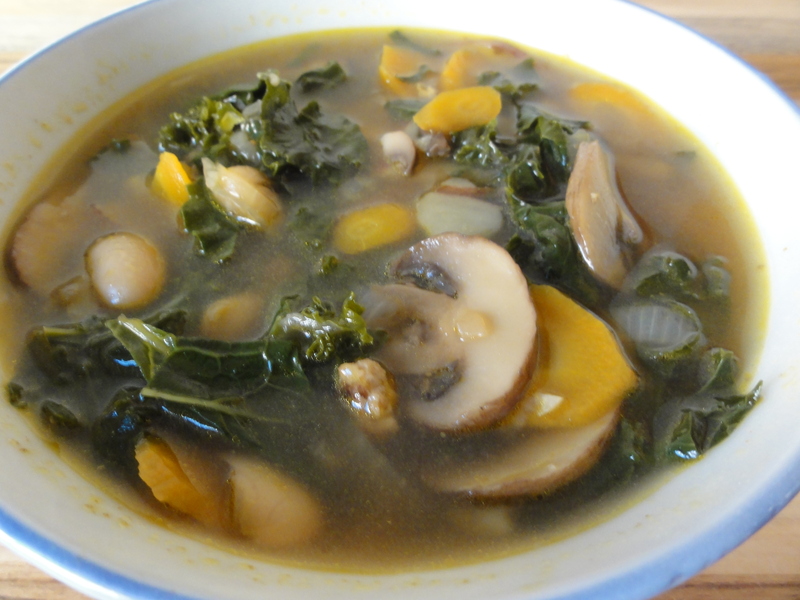 I tried making a kale and vegetable soup with clear broth last winter, and at the end of all the chopping, stirring and toiling over a pot on the stove, it tasted like….nothing. I saved it by adding some Asian flavors – dark sesame oil, soy sauce, and ginger. I ended up liking it so much that I’ve revisited the recipe since then, including these components from the start. It turns out that there was a way to make the original soup more flavorful too. The Portuguese have a version with spicy sausage and beans. Here’s my adaptation, with the Asian variation below. You can play with the vegetables and add leftover odds and ends from your crisper. Cook the veggie sausage in a skillet in some oil, breaking it up into bite-sized chunks if it is in patties. Stir in hot sauce and set aside. Cook the onion in olive oil in a soup pot until softened and starting to brown. Add the garlic and mushrooms, stir, and cook for a few more minutes until the mushrooms start to release their water. 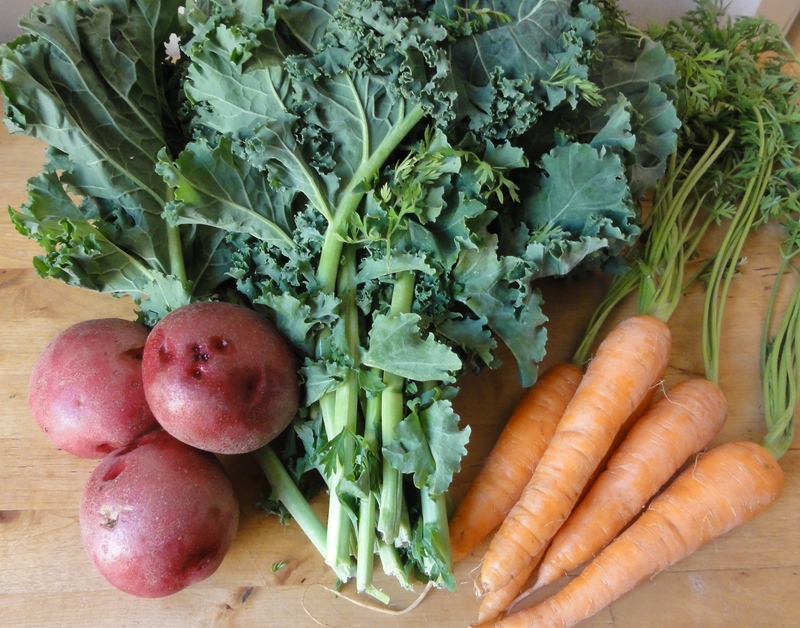 Add the kale, carrots and potatoes and cook for a few minutes. Add the sausage, broth, 2 cups of water, and some salt. Cover and simmer for 20-30 minutes until potatoes and kale are tender, adding more water as necessary. Add the beans and cook until just heated through. Season with salt and hot sauce and/or red pepper flakes. Drain, slice, and brown the tofu in a skillet with dark sesame oil and soy sauce. Add the ginger to the soup pot along with garlic and mushrooms. Season soup at the end with sesame oil and soy sauce along with hot sauce. I’m guessing you’re not supposed to review restaurants when you’re sick, but last week I was hit with the sniffles and decided it was the perfect time to try Sakuramen in Adams Morgan. 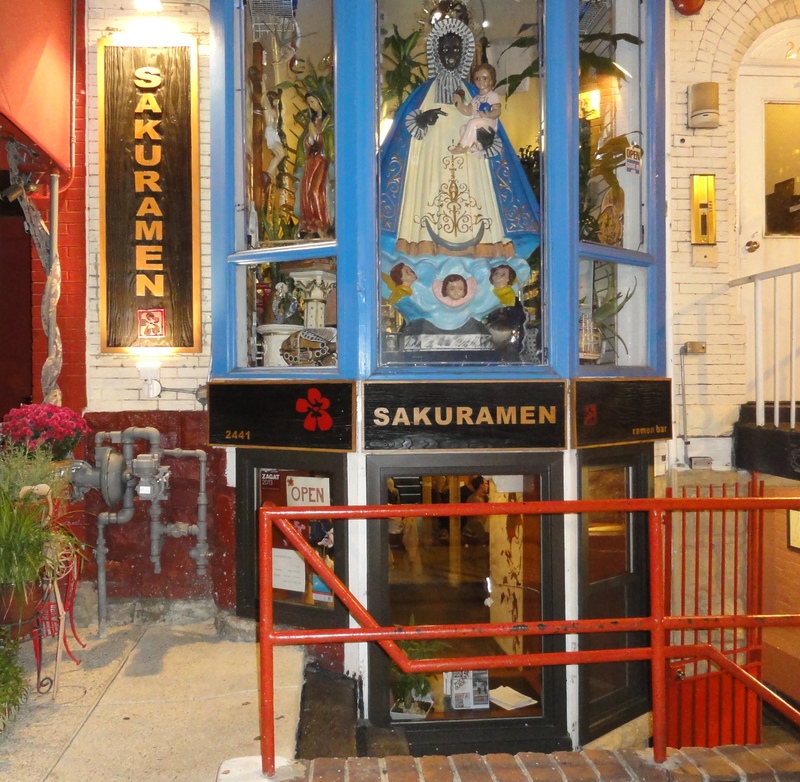 Sakuramen, which opened in May, is tucked under a small set of stairs beneath the ‘Yemaya Botanica Chango’ shop you’ve probably never set foot in. Inside, the space opens up to house an inviting communal seating area flanked by individual tables. ‘Sakura’ means cherry blossom in Japanese, so you’ll see these flowers featured in the decor. 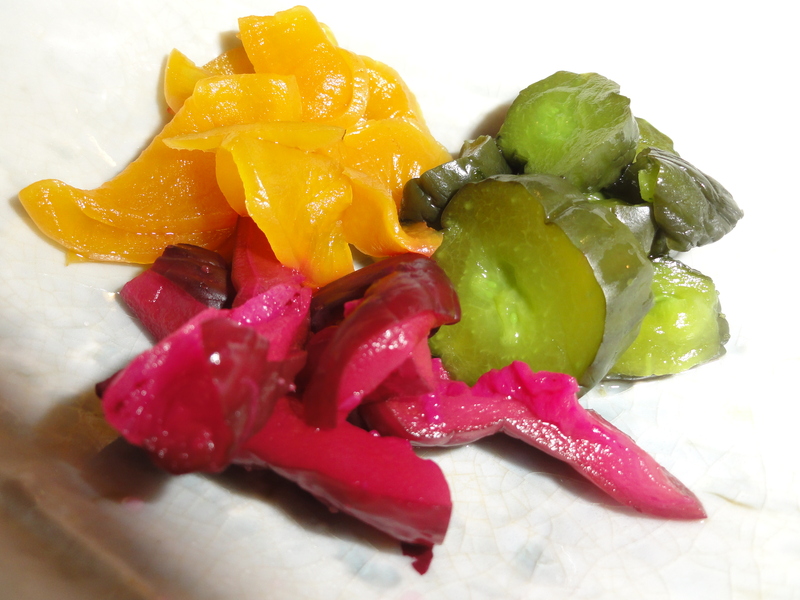 We started with oshinko, Japanese-style colorful pickled vegetables, which cut straight through my slightly phlegm-blunted senses and got my taste buds going. 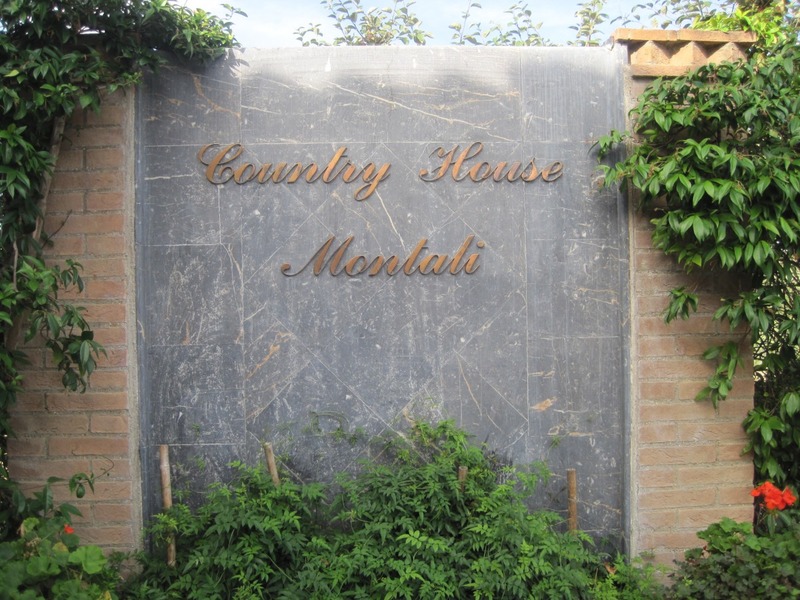 You gotta love a place that is named after its signature, best-selling vegetarian dish (or is it the other way around)? 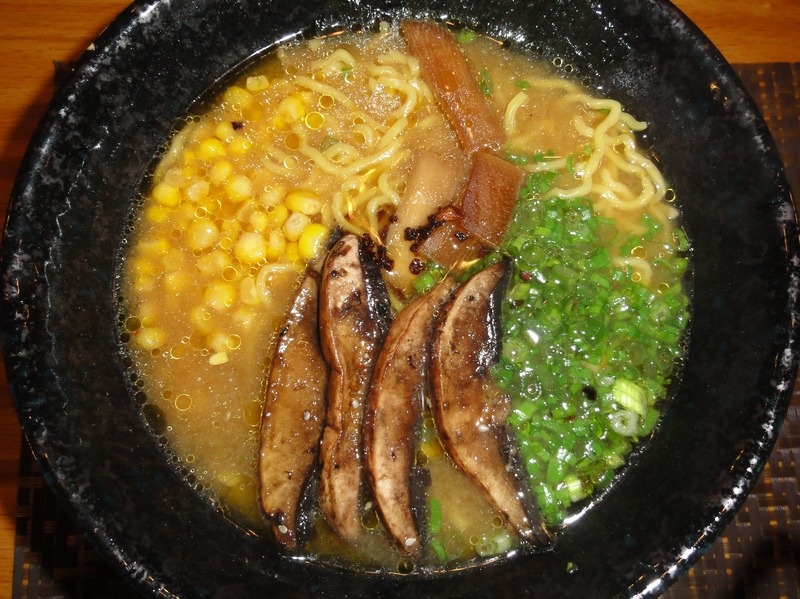 The sakuramen is heaped with curly noodles, portobello mushrooms, corn, green onions, and fermented bamboo shoots. There’s nothing fishy or seaweed-like about the kombu kelp broth (which I’m wary of as a life-long vegetarian). 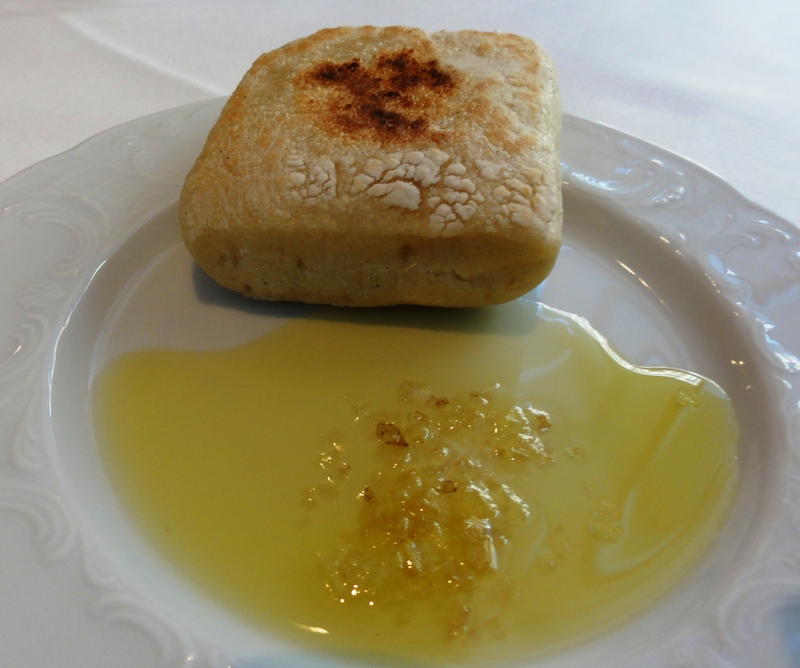 Instead, it’s savory and full of umami goodness, accentuated by shimmering droplets of flavored oil. The portobellos were actually kind of delicate and sweet, and along with the corn, provided a nice counterpoint to the thick noodles and just-salty-enough broth. I’m a fan of shiitakes and other mushrooms traditionally used in Asian cuisine, but they would have overpowered the rest of the flavors here. Although we were certainly satisfied after eating (I ‘punished’ my ramen, according to the server who took away my licked-clean bowl), we agreed that some tofu would be a nice addition of protein and texture. 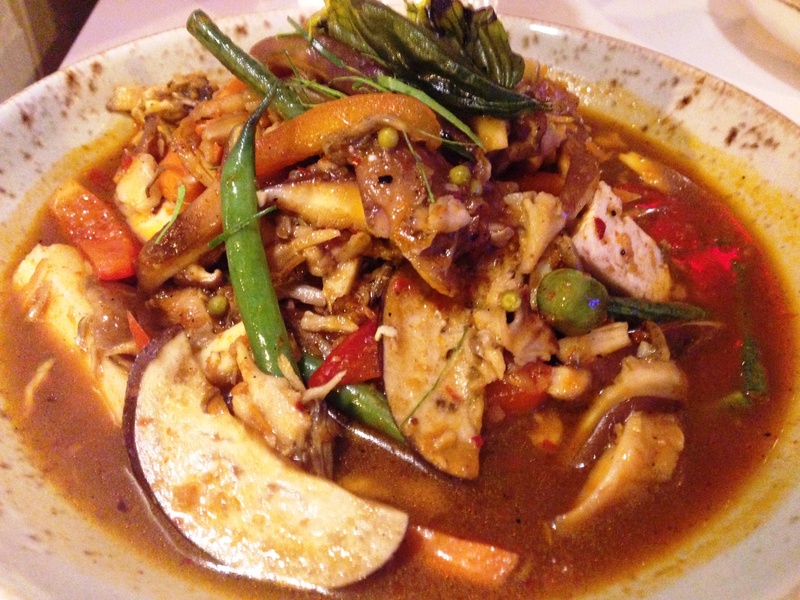 We did ask about adding the seasoned soft-boiled egg to our bowls, but the marinade isn’t vegetarian. 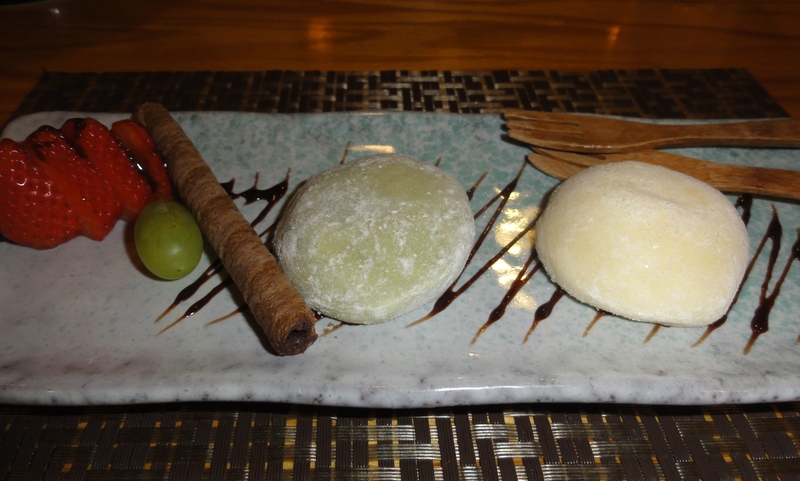 We finished with some green tea and mango mochi ice cream which was good enough, but I think I’ll skip it next time and let the ramen flavors linger on my tongue a little longer. In addition to the sakuramen, our server mentioned that the shroom buns are also a top seller, more popular than their meaty counterparts. While I generally find steamed buns bland, I’ll try this version stuffed with marinated mushrooms and scallions during my next visit. Which will be soon, as I expect to be a regular until cold season gives way to cherry blossom season.